ENTREPRENEUR: Want to ensure your start-up is a success? Find solutions for this $28 Trillion Market. Hold my handbag a moment, while I pull over between appointments to check my flat tire, send a text to my husband to remind him to pick up the girls early, and then call my assistant to let her know I’ll be running 10 minutes late for my next client meeting. This rhythm has become my every day: hyper-connected, overcommitted and “ride-or-die” for the success of my business, my employees, my friends and family. Truth bomb time: This is not only the life of the entrepreneur, but likely every Modern Woman. I’m constantly seeing an influx of new products and services that increase optimization and efficiency for startups and entrepreneurs. Yet, I’m still seeing the giant blind spot I saw when I first started my agency 10 years ago — a lack of category innovation specifically for the Modern Woman. And herein lies your opportunity. The Modern Woman is in desperate need. The last 2,000 years of civlization have not caught up with her rapid (r)evolution. Men once proudly built foundations of business through war, trade and exploration (and boy, are we grateful), yet we have not expanded its figurative horizons to include women — not just as valuable contributors to business but also as the new major consumers and influencers of commerce. EY has predicted that women will control 75 percent of discretionary spend by 2028. Gender is at the tip of the cultural zeitgeist, and the time is ripe for business to innovate through a “female lens” in order to better serve women’s needs and make first-mover advantage on this long-neglected market. 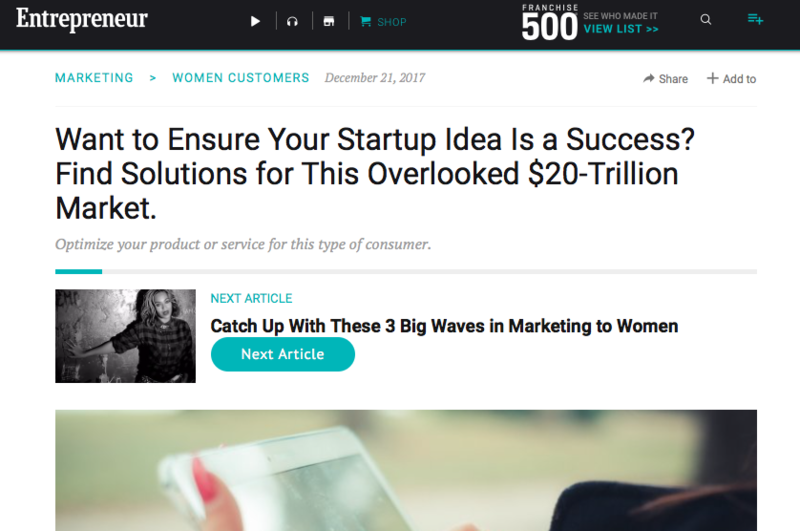 Product innovation for her does not mean giving your product “female friendly features” nor “pinking and shrinking.” Breaking through to greater innovation means digging deeper into insights that truly resolve ingrained problems. Not only are women these days feeling overly stressed by juggling a more demanding work-life-family social balance, they are also looking to feel less disenfranchised, better valued and more fulfilled and informed. This isn’t a marketing tactic to be pulled out of the hat later; these are serious R&D deliberations — does it enable women to live better lives? And if it doesn’t, can we iterate it to do so? Women are comprehensive when researching you. They’re very vocal within their circles — both online and off. And surprise! According to a report from email marketing solutions provider SimpleRelevance, women influence the final decision on 85 percent of all purchase decisions — some even you may think fall to men, including cars or home and travel. The SimpleRelevance study also indicates women consumer spending was $20 trillion in 2014, expected to climb to $28 trillion by 2019. It’s crucial for you to optimize all female consumer touch points. Start plotting out her customer journey from a welcoming awareness of your brand, to the physical and digital incentives encouraging her to explore your offering, to the lines of feedback and query that enable a streamlined and personalised customer service experience post purchase. Entrepreneurs have a big advantage when it comes to differentiating themselves here from heritage businesses whose massive size and siloed departments continue to fail in this regard. A recent delivery startup I engaged not only made me feel good about helping local grocery providers but followed me up with a personal call from a human being a week later asking how I found the service, and if it could improve it to make it easier and more adaptive to my lifestyle. It gets a 10/10 in my book. It took me six months to buy a new car, and even when I finally sat down to sign the paperwork it was an arduous process that became increasingly stressful as my very bored kids kept badgering me to leave. New businesses that identify women’s time pain points either in the process, or currently existing within unchanging industry structures, could capture the whole market by providing convenience and service that gives her back the time that she devotes to others. According to Melinda Gates, women worldwide spend an average 4.5 hours a day on unpaid work, and a survey of UK women by TVBed.com found mothers only have 17 minutes of me-time on average a day; giving her back even just one extra minute to herself is impressive. Warning: A potential pitfall is assuming that technology will always resolve this equation. In the case of my negative automotive experience, a salesperson trained to understand women’s needs and demands in the showroom would have enabled a better brand experience than the addition of a more efficient digital process when sitting with the after-sales officer. 4. Make the product that doesn’t exist, but should. If you’re an entrepreneur stuck for ideas, here’s a simple activity to do: Go up to any woman in your life and ask her either: “What would make your life easier?” or “Would [insert your idea] help out your day-to-day?” and I promise you — it’ll be a goldmine.